One day in the future we’ll be all be riding in mechs. We’ll fight in mechs, go grocery shopping in mechs, and if the folks behind Heaven Will be Mine have their way-- dating in mechs. If HWBM looks familiar, it’s because it’s by the folks behind We Know the Devil and is a sort of spiritual successor to 2015’s bible camp adventure. But this time you won’t be hangin’ out in the woods but fighting and sexting your way through space. I got the chance to talk to the team behind this game and pick their brains about flooded development studios, growing as creators, and their favorite pilots. Alright, first up: Who are you all and what is Heaven Will be Mine? Aevee Bee: I'm Aevee Bee. I'm the writer and co-creator. I also did a whole bunch of other extra random things here and there that weren't really writing, which I think when you're writing for games is pretty much a given. Mia Schwartz: I’m Mia Schwartz, the co-creator, lead artist and visual director of the game. Heaven Will Be Mine is our follow up to We Know The Devil, a love letter to the giant robot genre, and a love letter in general. Christopher Simon: Christopher Simon, optional party member who you pick up in a hidden area of the game after fighting him, with confusing backstory and confusing skill-tree/special abilities. Heaven Will Be Mine, in my head canon, is a phrase painted on the side of somebody's ship/-self, WWII nose-art style, probably accompanying some pin-up mecha art. Conrad Kreyling: Conrad Kreyling, developer and code man. Heaven Will Be Mine is a spiritual successor to We Know the Devil, but this time it's in space and there's mechs and stuff. 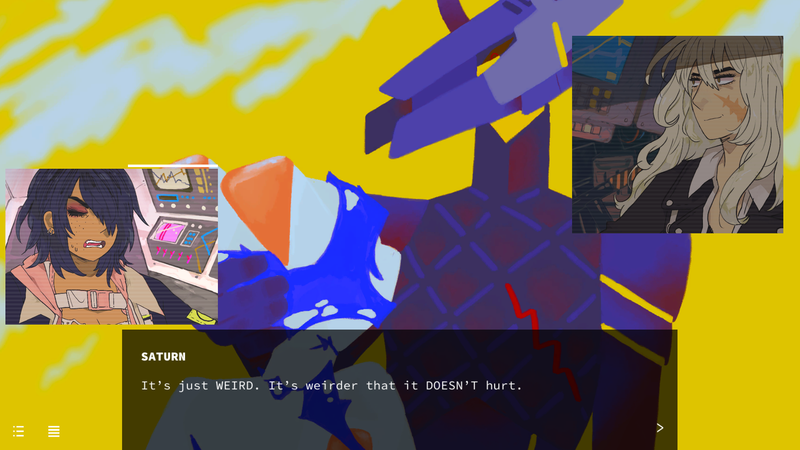 Heaven Will be Mine is a game that’s equal parts about big mechs and the personal lives of their pilots. Why did you want to combine these two different elements? Aevee: Giant Robot stories are almost always really about personal conflict. In fact, the whole idea of a giant robot in the first place is a way of depicting conflict as more personal—you can depict political and military struggle on a huge scale but still have intimate duels between individuals. I especially wanted to explore those ideas in the emails and chat conversations, and I'm really interested in what people think about some of the ideas expressed there, about conflict, war, and the metaphor of gravity. Mia: These things are very much woven into the fabric of mecha as a genre, and the messy human drama is the best part of them to me. Not only are the complicated personal entanglements fun and compelling, but the intense rivalries between heroes and villains also end up having a romantic, sexual tension to them. The original Mobile Suit Gundam series was a big reference point for the project and the creator (Yoshiyuki Tomino) was even quoted in an interview saying he wanted the audience to question if the series’ most iconic hero and villain were gay for each other. (Source) And like, yes. The audience did question. Long before even meeting anyone on this project I dreamed of getting to explore these themes in a mecha project and provide my own take on them, so this game is truly a bucket list item for me. This isn’t the first time that y’all have collaborated together. You also released We Know the Devil back in 2015. What did you learn from that project and how did that affect the development of Heaven Will be Mine? Aevee: We learned a lot from We Know The Devil, but Heaven Will Be Mine taught us how difficult ambition can be. From WKTD, we learned an ideal structure. From HWBM, we learned that growing from that structure is much more difficult than adhering to it strictly. This project was much more rough, with lots of personal circumstances on the behalf of the team throwing us for a loop, but I think in some way we've learned more from this project than the first one. I will definitely be doing something easier next time, however! Mia: We Know The Devil was my first game so it taught me that I could make a small, contained video game and people might even like it and pay money for it. There would definitely be no Heaven without We Know The Devil. Once Aevee and I knew there was interest in our ideas, and that we were capable of delivering a game, it emboldened us to try to go bigger and more mature on the next one and we thought it would be a reasonable, humble step forward but we nearly all died. But now it’s out so it’s all good! Jo Fu: I still remember our first call about We Know the Devil. As soon as we were off Hangouts, I asked Conrad, "Do YOU know what this game is about?" We had no idea!! The lesson we learned was: trust the voices of unique creators, and they'll make a unique and beautiful game. Conrad: One of the major takeaways from We Know the Devil was: don't trust web browsers. 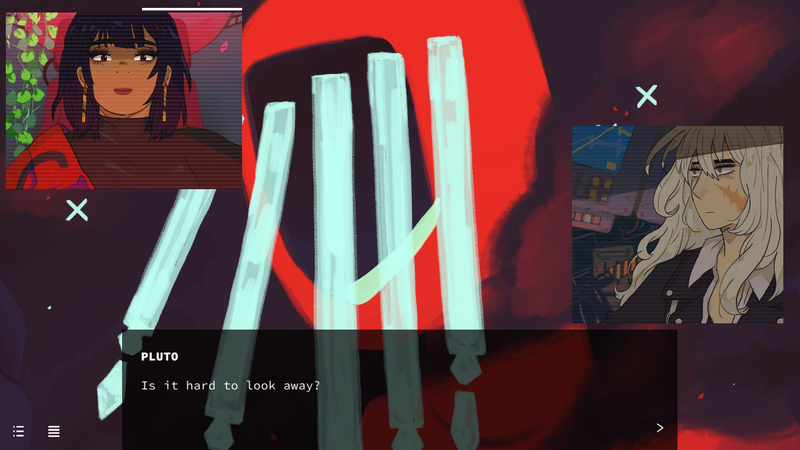 WKtD was released on htmlVN, an HTML5 platform for building visual novels I had started as a hobby some years back. Despite being pretty stable at that point, on launch day we discovered a pretty serious issue with iOS Safari that would crash the game before you finished it. While we had a really robust cloud save system which abated the issue somewhat, it was still a real frustration for users, and we delayed the game so I could resolve the issue. With Heaven Will Be Mine, we developed in Unity to provide first-class desktop support out of the box. It also gave us some really nifty tools that we wouldn't have had access to easily on the Web, like advanced blend modes for UI elements and really tight audio cue synchronization. Is there anything you want to tell people who don’t normally play visual novels about Heaven Will be Mine? Aevee: I think anyone who has enjoyed a book or a comic or a game's story before will enjoy a visual novel—if I had to say anything about HWBM in particular, or my approach as narrative director, it's that I think that every element of design is crucial to the game. It's not prose dressed up with sound and art; the sound, character art, UI, the way that your choices guide you through the game, all of this is part of the narrative. It gives us access to techniques we'd never be able to use in any other medium. You might barely notice them as you're playing, but they're so important to the experience. Also I think if you like mecha anime and gay girls falling in love (poorly) you'll like it no matter what. Jo: Folks talk about the game design of shooting games a lot -- certain level designs will make you run and gun, or take cover and stealth it out. Well, reading is a game mechanic too! We spent a ton of time tuning how you get information in the game, and the information you have is formatted and presented in different ways. Conrad: There's a lot of words in this one in a lot of places. Don't be afraid to say "I've read a ton of words and will come back to read more later." It's cool! You can save pretty much anywhere, promise! Do you have any wild stories from development? Maybe cut content or obscure features that you’re really proud of? Aevee: I'm just going to take this opportunity to apologize to Mars again. She was going to be a fourth protagonist in We Know The Devil, but we cut her because math would have made the game exponentially longer. She was actually going to be the third heroine in Heaven Will Be Mine, too! Pluto would have been her confidant, but during development, we found Pluto more interesting, and she had a better balance with the rest of the cast. This Mars is different than the one who would have been in We Know The Devil, so I might use her again someday. Mia: The initial mechanic was supposed to be based around a dating / hook up app like tinder or grindr. We spent a pretty long time thinking that would be part of it, but it came down to game flow and what we actually wanted to say. Tragically. Jo: The dev team lives just outside of DC, and three days before launch, we had a historic storm system blow through. We had just pushed a build where about half of the motion graphics were done, and we heard a fountain behind us -- our basement had sprung an enormous leak, and water was just POURING in. Sometimes, crunch means you work for five hours straight, bail water out of your office for another five, and then jump back into Unity before your feet get dry. Christopher: I wanted a "Clippy" character in the UI, an idea which was received well, but (reasonably) we never returned to that. Fanart please now. Conrad: We were integrating new assets and small text+graphics fixes until literally the minute of release. That said, I think we did manage to get everything we wanted into the game! Finally, who is everyone’s favorite pilot? Aevee: Mercury isn't a pilot, but he's everyone's favorite. He's the most fun person to write dialogue for. Mia: Pluto ... and side, side, side character Halimede. 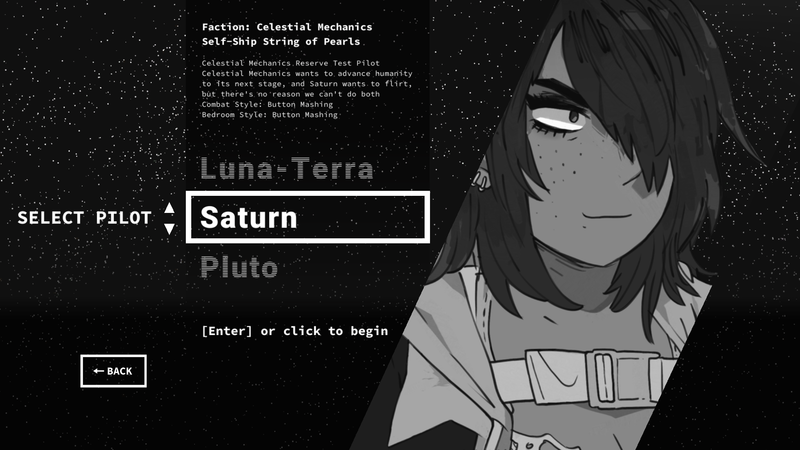 Christopher: Luna-Terra, who I believe uses the most toggles and switches and probably has a button somewhere with a protective shield over it. This interview has been edited for length and clarity. Heaven Will be Mine is available now. also excellent work, HWbM devs!!!! This is a game I will definitely be purchasing when I get decent employment again.